Bicruciate (anterior cruciate ligament (ACL)/posterior cruciate ligament (PCL)) lesions are rare, usually are caused by closed knee dislocations, and often are associated with peripheral injuries. The result of combinated anterior and posterior cruciate ligament lesions is a painful and debilitating knee instability that involves a discomfort for the patient, not only in sports but also in daily activities. Surgical treatment of ACL/PCL lesions is necessary to restore knee kinematics, and early arthroscopically assisted reconstruction has been recommended to recreate a correct central vertical rotation axis. 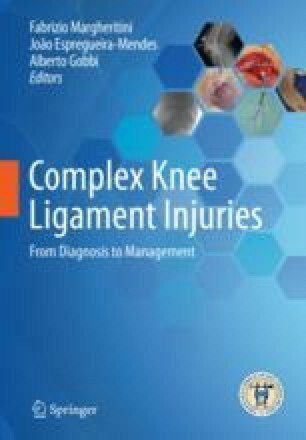 In the orthopedic literature, surgical treatments of combined ACL/PCL tears are different in timing, techniques, and graft choice. The purpose of this chapter is to illustrate our preferred approach for bicruciate lesions that consist in a full arthroscopic, single-bundle (pro anterolateral bundle) PCL reconstruction and single-bundle anatomical ACL reconstruction.